When YOU are the one guiding the play in a proactive way, it is a good game. When YOUR DOG guides the action and you are simply reacting to what he does, it is a bad game. Good games are an excellent way to tire out your dog by using his mind. They can also be an enjoyable way to proof your dog’s obedience. Bad games are an excellent way to teach your dog that misbehaving is a way to get your attention. They can also teach your dog that it is okay to ignore your commands. Here are some examples of bad games and – some ideas for good games. 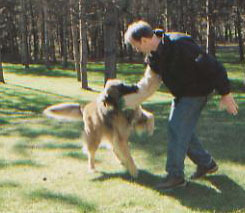 Many people like to wrestle and play roughly with their dogs. When we engage in these kinds of games with our dogs we encourage them to treat us like another dog. Think about it. When two dogs play together, they jump up on each other, bite each other, chase each other and test to see just who has more power. This is a VERY bad game as it teaches your dog to rudely jump up on you, bite you and challenge you. Sadly, I see many dogs that start out playing these kinds of games with their owners (often children) and end up biting them severely. Teaching your dog to do tricks exercises his mind and his body. There are some great books on teaching tricks available at your local library or book store. Bad game: Catch me if you can! Your dog grabs an item you don’t want him to have. You call him to you to try to take it away, and instead of coming he runs off with it in his mouth. You chase after him and try to catch him to get the item back. This is a bad game because it teaches your dog that he can out-run and out-smart you. It is also bad because teaches him to run away from you instead of coming when you call him. Find a place where there are only minor distractions. Hide in a place where you are easy to find and call your dog so that he can search and find you. Give him a BIG reward (love, petting, play, treats) when he finds you. As he gets better at the game, hide in more difficult places or play the game in areas where there are moderate to strong distractions (depending on your dog’s skill and reliability). This is a good game because it not only teaches your dog to come when you call him, it also builds a drive to search and find you when you’re not in sight. Playing a wild, aggressive, no-holds-barred game of tug-of-way with your dog, a game where he growls and bites at your hand to win, or where he learns to run off with the toy is a bad game. This game teaches your dog that if he challenges you, he might win. It also tends to make a dog more likely to bite and nip at hands and often turns into game where the dog runs off with the toy and ignores you. In polite tug-of-war games you initiate the play by showing the toy to the dog an inviting him to play tug with you. Hold the toy and give the dog a command like ‘tug’ or ‘take’ and encourage him to take the toy in his mouth. If the dog plays too roughly, you must end the game immediately and start a training session with the dog. If he plays nicely, continue on a bit making sure that YOU decide when each bout of tug ends. Unless you have a timid dog, only play this game in small bits. Be sure to end the game immediately when the dog gets too excited or nips at your hands. This game builds self-confidence in a timid dog. It can increase self control in dogs and it shows the dog you make the rules – but ONLY if you play it correctly! If your dog shoves or tosses a ball or other toy at you and TELLS you to throw it for him – you are playing HIS fetch game. If your dog refuses to release you the toy you’ve thrown or won’t bring it back to you, he’s playing a game with you. These games teach your dog to challenge you, to ignore your commands and to see you as a fool to toy with. In a good game of fetch, you initiate the play by showing the dog a ball or toy, telling him to sit and then throwing the toy after he sits. The dog politely brings the toy back and either drops it at your feet (not three feet away!) or – better yet – in your hand, so you can throw it again. This is a good game because not only does it teach your dog to listen to the SIT, WAIT, FETCH and DROP commands, it also shows him that you are the one who initiates and ends games. In a good game of fetch you should always end the play when the dog wants more. Dogs are social animals. Your dog craves companionship, YOUR companionship. Sending him out into the yard (even a safe, securely fenced yard) is NOT a good way to exercise him. 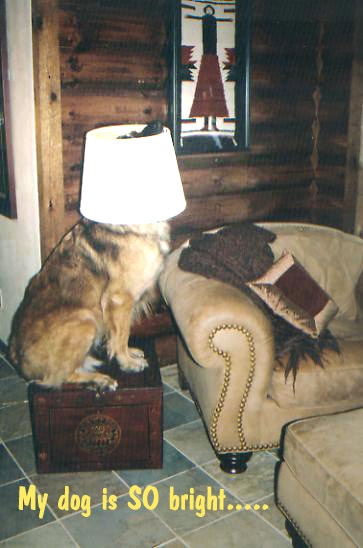 Leaving him out on his own for long periods of time gives your dog an opportunity to choose his own methods of entertainment. And in many cases these will not be things you would like him to do. This can teach your dog to bark incessantly, fence fight, dig holes, eat poop and engage in other bad habits. It also teaches your dog that you don’t have much interest in having a relationship with him. Your dog LIVES to spend time with you. Dogs evolved to be our companions in life. Spending quality time with your dog — time where your focus is on sharing time with him in a constructive way – is the key to building a meaningful relationship with him. Entry filed under: behavior science, dog, dog obedience, dog training, dogs, pet, pets. 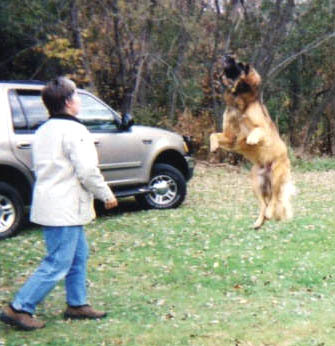 Tags: dog tricks, leonberger, play with dog. Good points. If people can just understand the minds of their dogs and use the right games and correction, we would not have so many dogs that people give up on keeping. It’s like herding a sheep, only a remote controlled one. Please tell me it fits under the “good” category. Great game ideas. My dogs love to play with a basketball sized tennis ball. I gently kick it around the yard and they chase it with me and it looks like doggie soccer. Well I guess I really knew what the correct answer was before coming here. 😦 But thanks for sharing all the good information! I’m a big sucker for animals but especially love dogs and they seem to latch on to me very quickly even though I don’t own one. This week a friend moved in with her beautiful and super friendly Golden Retriever Kenya…who happens to love me to death. She’s 3yrs old and I think she likes that I play with her, massage her, and take her on runs regularly. I can’t even sneak out of the house without her meeting me at the door with the most heartbreaking look of disappointment on her face. I’m always careful to be very consistent with my instructions and try to make it easy for her to understand my expectations but admittedly tonight I made a big mistake by play wrestling with her. It wasn’t very rough at all but she did get excited and started to play nip/soft bite at my hands. I knew while it was happening that it probably wasn’t a good idea. We had a blast and she went submissive whenever she felt me get stern or more physical but of course that was just with me. Moments later when her real owner reached out to her, She started nipping at her in a similar fashion. 😦 Bad Uncle Wayne. I’m 170lbs and a rough and tumble guy. Mom is 85lbs soaking wet and has no interest in that kind of play and of course we don’t want her to play like that with anyone else either. Sorry Kenya. 😦 It was just soooo much fun to see you happy like that and I admit that it was fun for me too. But seeing as though I can’t explain that you’re only allowed to do that with me, I guess our play fighting and wrestling days are over with. I am a new foster with a no-kill foundation & the problem I see, most often, that keeps good dogs from finding/keeping homes (other than dog aggression) is that owners don’t want to do any training with their dog. They will promise to take them to obedience but not go & return the dog. Or they will know about a training issue, ahead of time, and just don’t want to put in some time and consistency. It’s so sad to see & i’m trying to start learning how to do some basic training so I can start fostering these poor guys and make them more adoptable! I wish people would understand that even when they’re tired, taking the time to do some training – even 15-30 min a day (and please walk them! (: ) can not only make a big difference, but actually be rewarding, fulfilling & energizing! Thanks all! !